In the world of weight loss and dieting, there are many options from which to choose. What is confusing is that so many programs and products swear on giving the best results, but it seems that results may vary depending on the person. Some people spend a lot of money on things that do not work, and some are so baffled that they end up doing nothing. Do you struggle with losing weight on a continuing basis, yet never seem to achieve your goal? Well, you’re certainly not alone! There are a lot of conflicting theories on what works and disputes over which foods are “good” and “bad”. Many people become so frustrated with weight that goes down and then up again, they simply give up. Before you give up, you ought to try these healthy living tips and many guarantee that this is the way to go. 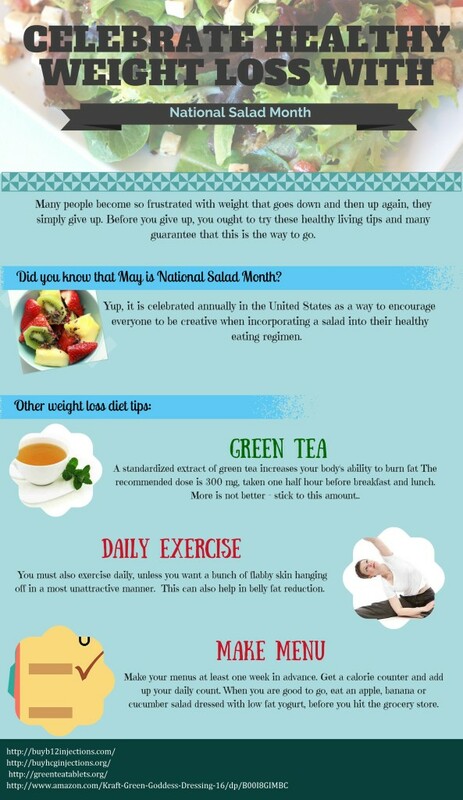 Before we go to these healthy weight loss tips, did you know that May is National Salad Month? Yup, it is celebrated annually in the United States as a way to encourage everyone to be creative when incorporating a salad into their healthy eating regimen. Research shows that aside from weight loss, eating just one salad a day can have a significant positive impact on your health. People looking for a healthy way to lose weight will be bombarded by all kinds of foreign blends, supposed secrets of oriental doctors, that claim to allow them to reduce fat the healthy way. In reality however, you have no way of knowing for sure what is really in these products. The healthiest way to lose weight is simply to begin healthy living. You can start healthy living by including salad in your daily diet and it doesn’t need to be boring. You can choose and experiment from many salad dressing recipes available online to make your salad more delicious and appetizing. Try a combination of these two simple salad recipes Avocado Grapefruit Salad and Chopped Spring Salad 2 ripe avocados, 1/4 red onion, 1 tablespoon chopped cilantro, 1 grapefruit (segmented), pinch black pepper, 1 bird’s eye pepper (seeded) 2 cups green, red, or yellow peppers, cored and chopped into 1/2-inch cubes, 2 medium cucumbers, chopped into 1/2-inch cubes, 6 small tomatoes, cored and chopped into 1/2-inch cubes, or 12 cherry tomatoes cut in half, 1 cup leftover crusty bread, cut into 1-inch cubes, 4 scallions, chopped, 1 cup feta cheese, cut into 1/2-inch cubes, 10 large basil leaves, cut into thin ribbon slices, 4 anchovies for a bit of kick as a seasoning. If you are looking on ways on how to reduce fat, there are many flavors of light, reduced-fat, low-fat and fat-free salad dressings on the market. Aside from salad, you could opt to include green tea for your weight loss diet. A standardized extract of green tea increases your body’s ability to burn fat. The recommended dose is 300 mg, taken one half hour before breakfast and lunch. More is not better – stick to this amount. You must also exercise daily, unless you want a bunch of flabby skin hanging off in a most unattractive manner. This can also help in belly fat reduction. Consult first with your physician for exercises which are safe for you. Make your menus at least one week in advance. Get a calorie counter and add up your daily count. When you are good to go, eat an apple, banana or cucumber salad dressed with low fat yogurt, before you hit the grocery store. Now, you are more psyched to finally start losing weight by eating and living healthy. You are also less likely to buy junk food than if you did your shopping while feeling hungry. You can do many things to find a healthy way to lose weight. Weight loss diet should be good for you. It should not threaten your health.